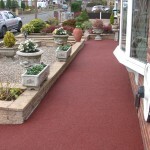 Are leading resin bonded driveway company customer reviews relevant ? Are leading resin bonded driveway company customer reviews a true reflection of a resin bonded installer? If you were to ask a resin installer then they would say yes obviously. But its not all about clients – its about the before and after. We at Drive-Cote Ltd like to pride ourselves on quality customer service whether they are potential clients or not. We are regularly contacted by homeowners asking for advice. We believe that as a leading resin bonded driveway company customer reviews are an important part of our business. They can serve to show the service we at Drive-Cote Ltd offer. One from a client who is not within our area of work…. “Dear Sirs Could you please provide us with a quote for a driveway that measures 289 square feet. The driveway is tarmac and is 31 years old. We are attracted to a dark red colour for our driveway. “Hi Apologies for the delay but we have tried to call you a couple of times Unfortunately you are too far for us to be able to provide works. There are National Companies who may be able to help. Thank you for responding to our query and we are sorry to note that your company is too far away to be able to assist us. We appreciate the alternative websites you have provided us with and hopefully they will be able to assist us. We at Drive-Cote like to think of our company as a local leading resin bonded driveway company providing quality customer service. So if you want free and honest advice then call Drive-Cote Ltd.
Ravenshead, Warsop, Sutton in Ashfield Ilkeston, Ripley, Alfreton, Chesterfield, Stonebroom, Higham, Shirland. Drive-Cote your leading resin bonded driveway company. Free no obligation quotes. This entry was posted on Wednesday, November 23rd, 2016 at 8:12 pm	and is filed under Chesterfield, Concrete, Derbyshire, Diary of a Mansfield Resin Driveway Company, Imprinted Concrete, Kirkby in Ashfield, Latest News, Leicestershire, Lincolnshire. You can follow any responses to this entry through the RSS 2.0 feed. Both comments and pings are currently closed.